Samuel Rhea Smith was born December 13, 1822 in Piney Flats, Sullivan County, Tennessee. His parents were John Smith and Catharine Humphreys. Samuel married Martha Jane Cross about 1842. William Charles (Charley) Smith (1865, married Sarah Matilda (Tilda) Benton). In 1850 the Samuel Smith household was in Division 1 of Sullivan County, Tennessee. The household consisted of Saml age 27, Martha age 24, George age 7, Simon age 6, Eliza age 4, and Margaret age 1. During the Civil War, their son, David Simon, enlisted in the Union army. Samuel and Martha moved to Lebanon, Spring Hollow Township, Laclede County, Missouri. They were there in 1870. The household included Samuel R. age 48, Martha J. age 45, David S. age 25, Margaret J. age 20, Martha C. age 14, and Charles C. age 5. Jane died on January 20, 1908 and Samuel died May 3, 1909 in Lebanon. Samuel and Martha were laid to rest in theBlackfoot-Atchley Cemetery. Samuel Rhea Smith m. Jane Cross, a daughter of David and Polly Cross a sister of Marshall, Sam and Elkanah Cross, and a sister of Jacob Slaughter's wife. They located at Lebanon, MO, and he died only a few years prior to 1913 when he was about 90 years old. The 1890 census materials was lost in a 1921 fire. David Simon Smith enlisted as a private in the Federal (Union) Army at Springfield, Missouri on 12 Jun 1864. He was assigned to Battery "B", 2nd Regiment Light Artillery, Missouri Volunteers. Per his Civil War Pension Application, applied for on 5 Jul 1890. David never saw combat. He contracted typhoid fever and spent an unknown amount of time in hospitals in Franklin Co, Missouri and Kearney Co, Nebraska. The typhoid caused his left leg to be diseased to the point he had ulcerations and open sores, causing one witness to state it emitted a bad odor in warm weather. The leg caused him such pain that he could not walk or ride a horse for more than 15 minutes at a time. Additionally, he had a "catarrah" of the head which left him with a permanently runny nose. He mustered out as a private at Benton Barracks on 20 Dec 1865. George W. Smith, 84 died Monday at his home at Chetopa, Kan., and the body was brought overland, to Springdale, funeral services being held Wednesday afternoon at 2 o'clock at Friendship, east of Springdale, conducted by Rev. J. W. Umphres, pastor First christian church with burial in Friendship cemetery. Mr. Smith was a native of Knoxville, Tenn., but most of his life was spent in the vicinity east of Springdale, where his family was reared. January 29, 1865, at Fayettville, this county, he was united in marriage to Miss Amanda Boyd, who died April 27, 1912. 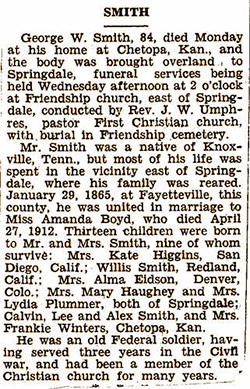 Thirteen children were born to Mr. and Mrs. Smith, nine of whom survive; Mrs. Kate Higgins, San Diego, Calif.; Willis Smith, Redland, Calif., Mrs. Alma Eidson, Denver, Colo., Mrs. Mary Haughey and Mrs. Lydia Plummer, both of Springdale; Calvin, Lee and Alex Smith and Mrs. Frankie Winters, Chetopa, Kan. He was an old Federal soldier having served three years in the Civil war, and had been a member of the Christian church for many years.